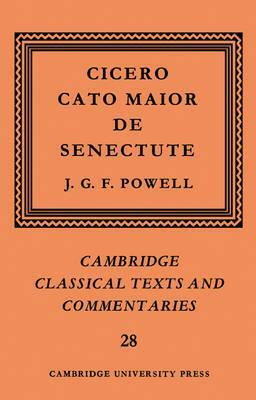 This is a complete critical edition of Cicero's Cato Maior de Senectute (On Old Age) with an introduction and commentary. The text is based on a fresh examination of the manuscript tradition while the introduction aims to place the work in the context of Cicero's writings on old age in the ancient world. The Roman and Ciceronian qualities of the work are emphasized, rather than the search for lost sources that occupied scholars in the past. Matters of text, language, and content are all considered equally in the commentary. Preface; Introduction; 1. The literary character of the Cato; 2. Old age in the philosophic tradition; 3. The text and the manuscripts; Texts; Commentary; Appendices; Bibliography; Index.